Antar Holiday Express, one of the popular bus operator in northern region of Malaysia with good reputation, is headquartered in Alor Setar, Kedah. Antar Holiday Express has been in the bus service industry for several years. They specialize buses services operating from northern region of Malaysia to various famous destinations within Malaysia and Singapore. 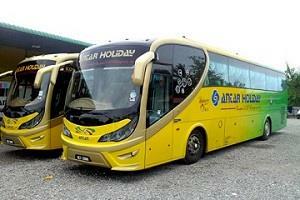 Antar Holiday Express is well-known in providing bus services departing from Kedah to various locations. They offer frequent bus services departing from Kedah to Terminal Bersepadu Selatan (TBS) in Kuala Lumpur, Larkin Terminal in Johor, Awana Bus Terminal in Genting Highlands, and Golden Mile Complex in Singapore. One of their most popular bus services is Alor Setar to Genting Highlands. With the upcoming completion of Twentieth Century Fox Theme Park, their bus route from Alor Setar to Genting Highlands will play a significant role to bring travellers in the north to visit Genting Highlands. Antar Holiday Express also famous in providing good quality of bus services and excellent customer service for their passengers. All the buses owned by Antar Holiday Express are single-decker equipped with air-conditioning and spacious 28 seats. 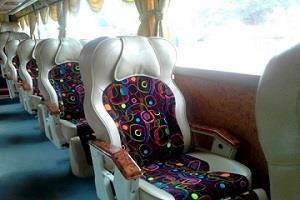 Besides, Antar Holiday Express seats are arranged in a 1 + 2 seating arrangement. With this seating arrangement, Antar Holiday Express allow their passengers to be comfortable seated throughout the journey. For your conveniences, you can now book Antar Holiday Express bus ticket online with just one click at BusOnlineTicket.com! 05400 Alor Setar, Kedah Darul Aman.